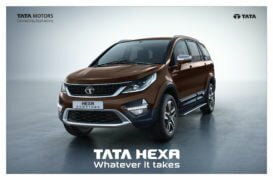 Tata Motors, the popular Indian passenger and commercial vehicle manufacturer, has decided to launch a special edition of its Hexa flagship SUV. Christened as the Tata Hexa Downtown Urban, this limited edition model comes with a host of cosmetic updates and a set of new features. The visual enhancements are for both the exterior and the interior. Complete price list is yet to be revealed. However, the company has confirmed that prices of the new Downtown Urban range start at Rs 12.18 lakh (ex-showroom, New Delhi). The latest special edition of the Hexa gets a new Urban Bronze exterior paint shade. Enhancing the visual appeal of this SUV are several chrome inserts, which aree around the headlamps, taillamps, side profile and rear view mirrors. Additionally, the special model also features Downtown badges, side steps, new carpeting, wireless smartphone charging, and a car care kit.The Downtown Urban edition offers two package options – Absolute and Indulge. The low-spec XE, XM and XMA trims get tan seat covers as a part of the Absolute pack. The Indulge package adds a set of stylish 16-inch alloy wheels to these variants. For the high-spec XT and XTA trims, the Indulge package adds two Blaupunkt 10.1-inch infotainment screens for the middle-row passengers. Other than this, the SUV also gets a heads-up display (HUD) that gives information on the speed limits, battery voltage, and tyre pressure. There are no changes in terms of specifications. Powering the Hexa Downtown Urban is the same 2.2-litre VARICOR 400 engine that powers the regular model. This four-cylinder, turbocharged Diesel engine outputs a maximum power of 156 PS along with a peak torque of 400 Nm. The entry-level XE variant gets a 150 PD-320 Nm version of this motor that comes mated to a 5-speed manual transmission. The more powerful version of this engine offers two transmission options – a 6-speed manual and a 6-speed automatic. 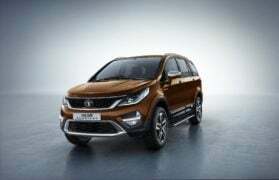 The top-end trim also gets an optional four-wheel drive system that makes the Hexa sufficiently capable off the road. The new special edition of the Hexa SUV comes with several new features and visual updates. This will surely lead to a significant increase in the prices. While the company is yet to reveal the full price list, it has confirmed that the entry-level model costs Rs 12.18 lakh (ex-showroom, New Delhi). The top-end model should cost roughly Rs 18 lakh. We will update you with the official prices as soon as the full price list is out. As the new limited edition doesn’t get any mechanical updates, the specs remain exactly the same. The entry-level XE model continues to come with the lower-spec VARICOR 320 motor that comes mated to a 5-speed manual transmission. All other trims get the same 2.2-litre Diesel engine but in a higher state of tune. In its lower state of tune, the engine offers 150 PS and 320 Nm. The more powerful version offers 156 PS and 400 Nm. Transmission options include a six-speed manual and a six-speed automatic transmission. The top-level XT trim even offers an optional four-wheel drive system that makes this SUV sufficiently capable off the road. The manual transmission variants offer ‘Super Drive Modes’ while the automatic model offers a Sports model. The drive modes include- Auto, Comfort, Dynamic and Rough Road. The Hexa offers a mileage of around 12 KMPL in the city. One can easily extract up to 15 kmpl on the highway. This is definitely a decent fuel mileage for a car of this size and with this much power. As the new limited edition model brings in only features and cosmetic updates, there is no change in the dimensions of the SUV. The Hexa measures 4,788 mm in length, 1,903 mm in width and 1,791 mm in height. It has a wheelbase of 2,850 mm and a ground clearance of 200 mm. The fuel tank capacity stands at 60-litres. What are your thoughts on the new 2017 Tata Hexa Downtown Urban Edition? Share your views on this special model by penning them down in the comments section below. Stay tuned to Car Blog India for latest news updates on the Tata Hexa and all cars and motorcycles in India.